Psoriasis is a persistent skin disorder, where the skin cells get multiplied faster than normal. Here white scales are appeared on the surface of skin due to the pile up of skin cells.It is usually affected on various body parts like knees, torso, elbows, palms and scalp. Ayurveda is an oldest healthcare system which uses the science of life and longevity. Various skin disorders can be treated effectively with ayurveda. It is natural and free from side effects. 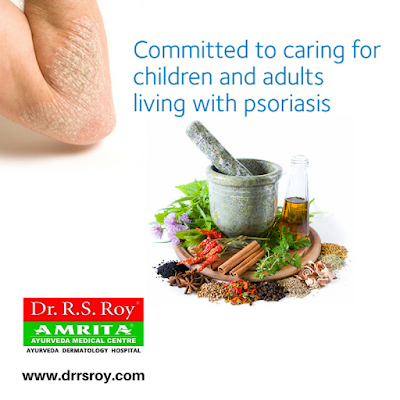 Get treated for psoriasis by the best dermatologist in Kerala. Psoriasis is developed due to the accumulation of toxins. It is therefore removed out using panchakarma , by which the blood gets purified and toxins get removed. Apart from this, massages with oil, powder; steam bath; application of ointments etc. are also included in the treatment. Amrita Ayurveda Medical Centre is one of the best ayurvedic skin hospital in kerala, which provides the best psoriasis treatment kerala.